The Calendar is a fully featured mechanism for recording the important events in an initiative and displaying other information such as resource allocation. There are day, week and month views and the display can be set to show Calendar entries, Project Tasks and Resource Allocation. When a resource has been allocated - for example to analyze a set of requirements - a user can drill through from the Calendar to the requirements' location in the Project Browser. There are also fully configurable Event Types, Categories and colors. The work of a Business Analyst will involve a wide range of events including things like: workshops, interviews, focus groups, collaborative games, brainstorming sessions, reviews, observations and meetings. All of these events can be conveniently recorded and managed in the Calendar. 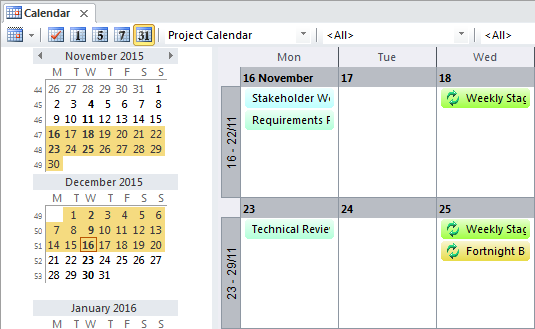 When resources have been allocated to elements and tasks have been assigned to individuals these can be displayed in the Calendar. The Calendar can be used to schedule and view events such as meetings, milestones, reviews, workshops and more. It can be used to view the allocation of resources to elements in the repository such as who is analyzing a set of requirements. It can also be used to view Project Tasks. An analyst can conveniently click through to the elements in the Project Browser or the Project Tasks. The Calendar has a number of options including the ability to create recurrent events. 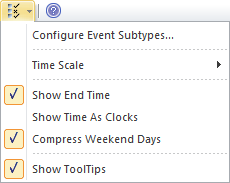 There is an options toolbar icon that allows aspects of the Calendar's appearance to be configured.